Wait...there's no Jets drama at camp? Sure, it's only Day 2, but believe it. With quarterback Ryan Fitzpatrick back in green, things are peaceful and stable for Todd Bowles's team...so far. FLORAM PARK, N.J. — Hear that? I don’t either. The drama alarms aren’t going off in Jets camp. For once. And second-year head coach Todd Bowles could get used to this. Not that he’ll let himself get comfortable enough with the lack of trouble to actually start expecting such a blissful state to continue. But for now, the Jets pretty much have the team they hoped and thought they’d have at the start of camp, with New York checking off two big things from its to-do list with the re-signing of starting quarterback Ryan Fitzpatrick on Wednesday and the contract extension of defensive lineman Muhammad Wilkerson two weeks ago. As a long-time journalist with an appreciation of deadlines and their motivating impact, I applaud the Jets for getting their most important pieces of work done just in the nick of time, which has made for a peaceful early vibe in Gang Green-land. I was at the Jets’ second day of training camp last year, too, and that’s the day the Sheldon Richardson speeding/child endangerment story broke, and not long after that, New York lost its No. 1 quarterback Geno Smith when teammate I.K. Enempkali broke his jaw with a punch. The pads don’t go on in Jets camp until Saturday, but so far, so good. And this is a team and a coach who seem better off for having weathered last year’s storms and come out standing. “The things that happen off the field are so different in this job,” Bowles said. “The timing of it all, and the surprise is when it comes and then you have to gather yourself for a minute and still make a decision. But the first 30 seconds to one minute is like, ‘You’ve got to be kidding me.’ Then after that, it’s like ‘Okay, what do we do going forward? More stuff will undoubtedly come up at some point this season and blindside Bowles and his Jets. But for now, they’re enjoying the relative calm of an early camp devoid of significant surprises. • First off, Christian Hackenberg might be the heir apparent, but at quarterback, the story of New York’s camp so far is the hair that apparently never got cut even once this off-season by newly re-signed starter Ryan Fitzpatrick. Talk about cap room, I’m not sure how Fitzy could even possibly wear a cap these days, and I’m guessing his helmet is a tight fit too. 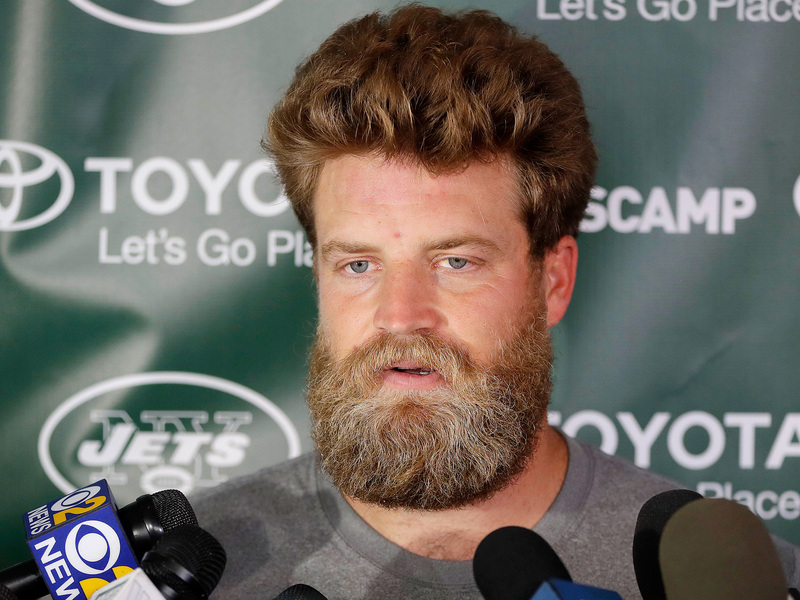 With that mountain man beard and his thick, wavy bouffant up top, it’s almost as if you could take Fitzpatrick’s head and flip it upside down and it would look almost exactly the same. Fitzpatrick said on Thursday he actually avoided going to his barber during his holdout once a New York Post columnist went out and did a story about the place in early June. But now that he’s signed for $12 million guaranteed this season, you’d hope Fitzpatrick could get that unruly beast under control and start again being the face of the franchise, rather than just the mass of hair of the franchise. • The Jets petitioned Bowles for more music during practice this season and were partly successful. The tunes were cranked on Friday until the team drills started. • Standout defensive end Sheldon Richardson was absent from practice Friday, but it was an excused absence, allowing him to handle some personal issues, Bowles said. New lead running back Matt Forte is another player missing some early camp practices. The ex-Bear said he tweaked his hamstring “about a week ago” and is taking the cautious approach, sitting out the first two days of workouts. With both Forte and veteran rusher Khiry Robinson out (he’s on PUP), those absences have given rookie speedster Romar Morris a chance to flash his skills from the backfield, and the ex-North Carolina product has taken advantage of the opportunity, earning a mention from Bowles after Friday’s work. Lastly, star cornerback Darrelle Revis remains on the PUP list to start camp, after having wrist surgery in March. No one is willing to put a timetable on his return, but I’m willing to bet Revis won’t be seeing much preseason game action. Why risk it? Bowles said he’s not concerned about Revis missing the regular-season opener. • Not only will the Jets not sneak up on anybody this season after winning 10 games a year ago, but their schedule also looks considerably tougher. A slow start could doom their season, and you can see the makings of one on their schedule. New York plays five of its first six games against teams that were in the playoffs a year ago, four of them on the road: Cincinnati, at Buffalo, at Kansas City, Seattle, at Pittsburgh, at Arizona. And that Week 2 trip to Buffalo is no layup, because it’s on a Thursday night with Hall of Famer Bruce Smith having his jersey retired at halftime. • Buster Skrine and Marcus Williams are two of the candidates to start at the other cornerback opposite Revis, but don’t sleep on rookie Juston Burris, who had a great day in practice on Friday. No. 38 had a number of nice moments, none bigger than when he had a pass defensed against Brandon Marshall in one-on-one coverage near the goal line. At 6' 0", 212 pounds, the North Carolina State product has some size and coverage skills. Q1: Did you feel snake-bit at times last year as a rookie, with the broken rib/lung injury early in camp, then the ACL injury to your right knee in December? A: I tried not to give in to that. I’ve got a lot of support behind and my faith in God to lean on. I just felt like everything happens for a reason. I just trusted in God and kept moving forward. I know there’s something bigger at the end of the tunnel. Q2: What you bring to the receiving game is so different than what Brandon Marshall and Eric Decker do for the Jets, in that you can stretch the field and add verticality. How often do you let yourself dream about the possibility of adding your deep threat to what they do on shorter and more intermediate routes? A: Not just myself, but without the rest of the receivers we have, too. All of us bring something different to the table. Me, I feel like I’m very, very good at that threat doing deep downfield. And I’m looking forward to coming back and trying to add that to this team. I felt myself this offseason getting stronger and getting a little smarter with the game, and the offense is coming to me easy now. Q3: When do you believe you’ll be ready to play again after the ACL injury? The 10-month mark of your rehab will be late September, early October. A: I’m not sure when they’re planning on having me back, or what the exact timetable is. My only focus is to try and get better each and every day, and whenever I feel ready, and they feel I’m ready to come back, coming back and just grinding. When I come back I just want to be 100 percent because I don’t want to be hurt any more. This was my first major injury I ever had in my life, and my first surgery, and it was a serious one. So I’m just trying to focus on things that are going to keep me on the field. I’m starting to eat a lot better. I’m starting to do things for my body more. It’s all process and I’m trying to stay on top of it. Q4: How good was it to see your quarterback, Ryan Fitzpatrick, walk back in that door the other night for your first team meeting? A: Honestly it kind of threw me off because I really didn’t think that was going to happen like that. When he walked through the door I was like in shock. But I think it’s good for the team just because that one of the things that a lot of us was worried about and were pretty focused on. He’s very, very smart and he can help you with anything on the field, so it’s good to have somebody like that at the quarterback position. Q5: Are the Jets this year going to see the Devin Smith they thought they drafted in the second round in 2015? A: Yeah. Absolutely. Whenever my time comes, I’m going to take full advantage and go out there and bust my tail and work hard. Unless you count how close the Jets came to opening their camp with Geno Smith as their No. 1 quarterback, there’s really not a lot of dramatic change from last year’s roster. But signing Matt Forte to replace Chris Ivory as the lead back represents a pretty major switch in a revamped backfield, with the ninth-year veteran still a versatile and dangerous threat even as he hits the dreaded age of 30. Besides Forte, other newcomers include ex-Saint Khiry Robinson, who is on PUP as he recovers from last season’s broken tibia, as well as recently signed veteran Bernard Pierce, and the aforementioned rookie Romar Morris. Only Bilal Powell returns from last year’s backfield rotation, with Zac Stacy being waived this week after failing his pre-camp physical. New York’s backfield has some intriguing potential and a lot of varied skill sets to call upon. Forte is obviously the key, and his rushing, pass-catching and blocking still make him one of the league’s most well-rounded feature backs. Two days does not a standout camp make, but the 2015 first-round pick is showing early signs that his second season in the league will be better than his first, and he was pretty good as a rookie. Williams gets a little overlooked with Wilkerson and Richardson as his linemates, but maybe not for long. Even when he’s not wearing pads, Williams consistently seems to get some solid pass rush push, and wind up in the backfield. Some Jets observers believe he’s ready to take a significant second-year step, and give opposing offensive lines another major headache to handle. According to Williams, this is the first time since high school that he will be playing in the same defensive system for a second consecutive season. Finally having continuity might be a difference-maker for him this season.